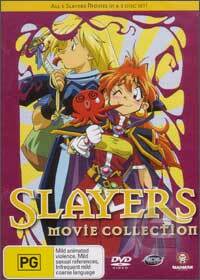 The Slayers Movie Collection features all five movies of this extremely popular anime series on 3 DVD’s and is the definitive box set for this series. The series follows Lina Inverse, a thief and sorceress who is drawn into a strange and ambilevous struggle of good versus evil as she follows the clues from dreams in an attempt to go back into time and make things right. Unfortunately for our heroine, things go from bad to worse as she faces a variety of adversaries in attempt to use her powers to set things right. With high quality video and audio, a few special features thrown in here and there, this 3-disc boxed set is not only great for those that love the anime genre but also for those that wish a taste for the more subtle aspects of anime. The indomitable Lina Inverse and the inexplicable Naga the Serpent are in trouble up to their eyebrows again! All Laia Einburg wants for her golem-making father Galia and her equally ambitious brother Huey is to end a long running feud. But her world gets turned upside down when short-stature Lina Inverse and overly endowed Naga the Serpent save Laia from a rampaging golem. Lina Inverse and her sidekick Naga the Serpent are happily enjoying lunch when the entire town ducks under cover before an invasion of Marlene Culvert and her legion of bloodthirsty dragons. Lina Inverse and Gourry Gabriev have teamed up again along with their friends from the original Slayers TV series to save an indulgent village from the wrath of an underwater nemesis.